Home » Scuba diving news / articles » Is Suvadi diving for you? IS SUVADI DIVING FOR YOU? Travelling to south is a long route but once you arrive at Gaafu Alif atoll Villingili island. The serenity of the environment will take you by awe. Every atoll you pass from Gaafu Alifu , Gaafu Dhallu, Laamu to Addu are quiet historic. Old traditional houses, sandy roads, ladies busy drying fish. At dawn the Fishermen set out for fishing and they come back at dusk. These fish are cooked and prepared by the women to delicious dried fish or rihaakuru( fish paste). Fishing is still their main livelihood. Suvadi diving is for those who loves to dive at channels (Kandu) which are formed in between two islands. It's a thrilling experience diving into exotic colourful coral gardens, It is for those who love great pelagic fish. 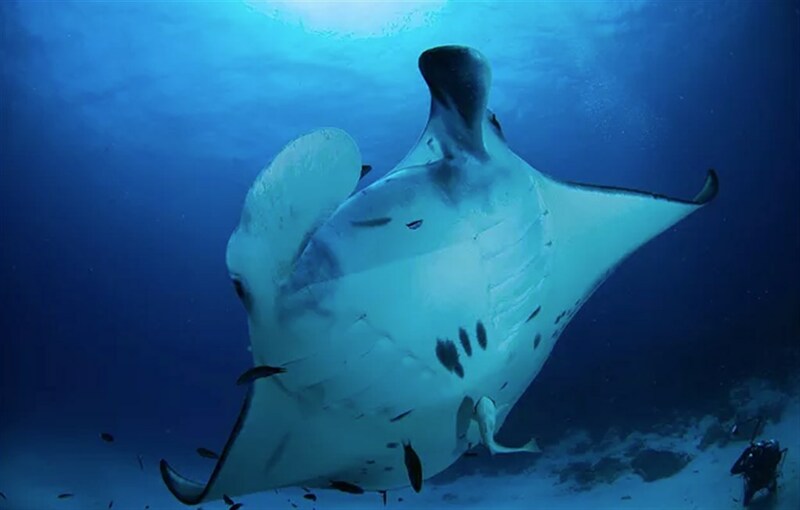 The current at these channels mainly attract visiting manta rays, green turtles, grey reef sharks, hammerhead sharks, tiger sharks, fox sharks,moonfish and a variety of reef fish around the pinnacles. Also there is a great chance of seeing whale shark at night coming towards the boat attracted by the planktons. Gaafu Alifu atoll is the largest atoll in Maldives in deep south. The reefs which are full of life and untouched lagoons for the past 50 years. Get ready to be welcomed by varieties of sharks, nurse sharks, black tip sharks, white tip sharks, grey reef sharks and occasional visits of hammerhead and grey reef sharks. When you come to south of Gaafu Alifu Atoll you will find interesting sloping reefs, drop-off walls and at times it has a drifting ocean current. These are deep channels. The dives are exotic here, you get to see manta rays, thresher sharks, tiger sharks and spinner dolphins. Fuvahmulah is another great atoll for channel diving, drop off walls, sloping reefs and deep channels. Depth is roughly 25 meters. You can expect to see tiger sharks,thresher sharks with black eyes and whitetip sharks around the reef. You will also come across huge manta rays which are much larger, compared to what you see in other parts of Maldives. Addu is popular for the biggest dive wreck in Maldives. It's also popular for its vibrant coral patches in the north. There are 4 channels in the atoll. Few overhangs and drop offs around the atoll. You can expect to see around 15 to 20 grey reef sharks at shark point. And green sea turtles and Hawksbill turtle are regular at these dive sites.Currents are not strong so diving is great for an average diver. ‘Maa kandu manta point’ has a incoming current and so you will get to see manta rays in the morning. Join our next Suvadi dive trip on MV.Adora, MV.Crown request more info! How to Defog your Scuba Mask once and for all! So you want to be a cave diver?